Right now the expected release of Chapter 2 is around the end of June. I really wanted it to come out around April / May, but it has been taking longer than I thought, and I’m sorry for that. Why is it taking longer than expected? It’s mainly because my original schedule was really optimistic. I thought it would take something between 4-5 months, like the first chapter, and it turned out to be about twice as much. Of course, I knew from the beginning this chapter was going to be bigger, but I thought that since I already had the basic code structure and the graphic style, plus most of the gameplay choices were already made, It was going to save me some time. Well, it did save some time, but not nearly as the work that was added. It’s not only that Chapter 2 is, like, three times bigger the Chapter 1, and this is the first time for me working on such a (relatively) big game . It’s also because planning chapter 2 meant to also plan ahead and think about the next 3 chapters (There are going to be 5 chapter in total), and how the whole story turns out. When working on the first chapter I didn’t have a solid skeleton of the plot, just a vague idea of the storyline, the characters and the ending. I basically knew what I needed to know in order to make a first chapter and to plant some clues. The reason for that was that Chapter 1 was sort of a “pilot” for the game, and I didn’t know if there was even gonna be a second one, so I didn’t want to sit and plan 5 of them. But after the first chapter was released, and I decided to continue the game, I knew I didn’t want to move forward before I build the whole story, and it took a while. Another reason I think this chapter takes more time is that there’s more planning involved. There are some new mechanics which make some of the puzzles more complicated, and I wanted the player to get to know these mechanics very gradually. Also the plot is a bit more complicated. More characters are introduced, and I had to think about their relationship with the main character, as well as with one another. Mostly, I just want this chapter to be as good as it can be, and I try not to rush it, even though I really want it to be out already. I believe by now the chapter is 90% done, and in about a month of hard work it will be 100% done. And finally, I wanted to thank the people who showed interest in the 2nd chapter over the past few months, your comments are really what gives me the motivation to keep going. So, thank you. It’s been 10 months since I’ve published Chapter 1, and I wanted to dedicate a post to the issues I have fixed during this time, after reading people’s comments and watching them play. I am currently working on chapter 2, but still find myself going back to chapter 1 pretty often to improve it. Since the game was released I have been fixing little issues here and there – small bugs, missing animations – but there is a more serious issue that I have to deal with in the long term – People get stuck. A lot. It happens for two main reasons. The first one is that sometimes the puzzles are too difficult or counter-intuitive for some people, and the second one is that the progression in the game is not always clear, and people kinda get lost. Especially in the beginning. So, I know It’s not possible for the difficulty level to be perfect for everybody, since people have different skills and different levels of experience with adventure games, but still, I would like my game to be enjoyed by as many people as possible. I didn’t want to make the puzzles easier, but I still wanted many people to succeed, so I decided to add a hint system. 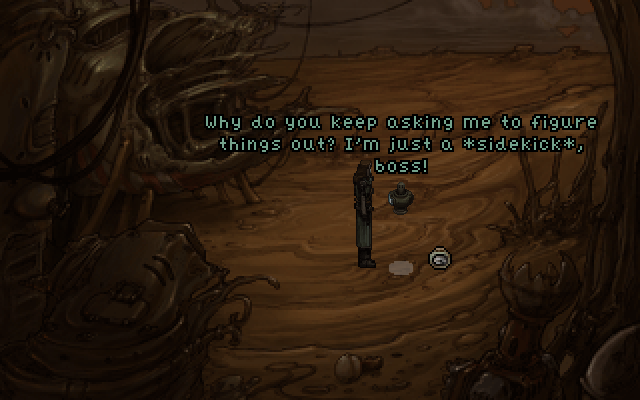 t was important to me that it would be integrated within the game world, so I tried the model of Primordia, a game by Wadjet Eye Games, which I really love. In that game you are a robot and have a small Sidekick drone who follows you around. You can speak to him whenever you want, and if you address him a few times in a row he will start dropping hints and suggestions that help you progress. I thought something like this could be a good fit, since llehctiM already kinda follows you around anyway (in the mirror world), so I added an “I’m not sure what to do next”option in the dialogue, and when you choose it, llehctiM will give you a hint. That way people who are struggling can consult llehctiM, and people who aren’t can just keep playing without ever asking for help. This system also functions as a reminder, for players who came back to the game after a long time, or maybe weren’t paying attention at some point, and are now not sure what they were supposed to do next. So, I assumed this would solve the problem, but about 2 months ago I was showing my game at a conference, and I got to see people playing the game. This was the first time I saw complete strangers sit down and play my game, and it was a hard experience, since it didn’t go very well for some of them. What I discovered during that time was that many of the players didn’t even get to the point of passing to the mirror world. They would just go out of the bedroom and start wandering around the apartment, and pretty soon get frustrated that nothing is happening and give up. One of the reasons was that passing through the mirror was a 2 stages process – first you can look at it and discover Daniel’s reflection is gone. Then, a “touch” action is added to the action list, allowing you to touch the mirror, and then, after Daniel’s hand passes through it, he will decide to walk in. What actually happened is that the players looked at the mirror once, and then went to look at other things. Only a few of them interacted with the mirror for a second time. I didn’t really anticipate it, since I thought that Daniel’s reflection disappearing would be a good enough reason for people to stay interested in the mirror, but apparently it was not. So, I ended up uniting these two actions – Now, when you “look at” the mirror, Daniel will look at it, try to touch it, and then walk through it. Everything will happen automatically and you won’t have to interact with the mirror twice. This only solves a part of the problem, since some people don’t even look at the mirror to begin with, they just go out of the room and start looking around the apartment. 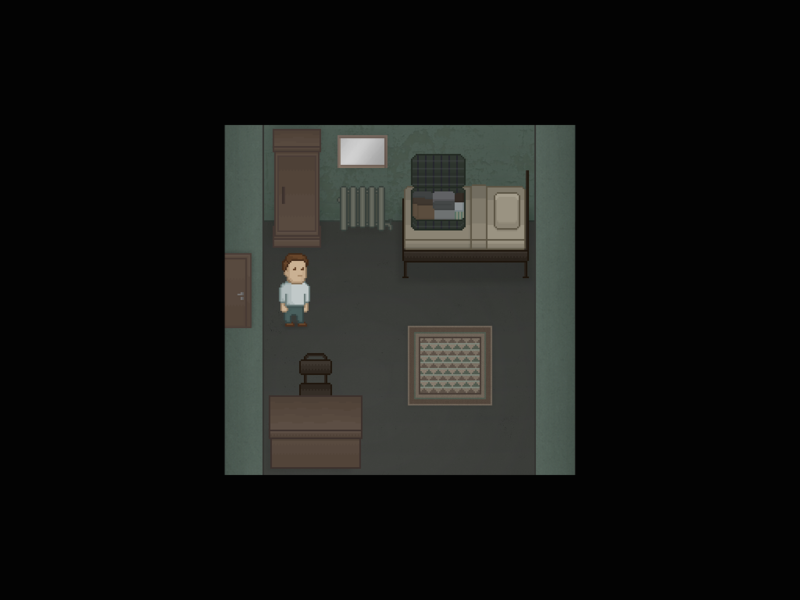 A possible solution would be preventing Daniel from leaving his bedroom until he looks in the mirror, but I’m still not sure about it, since I wanted the players to take a look around the real apartment before passing to the mirror one, so that later they’ll have a point of reference. At a second conference, a few weeks later, I brought an improved version of the game, now with the united mirror interactions, but I discovered that even though most people would now get to the point of entering the mirror, they still didn’t always get to the room where they meet llehctiM. Some of them would “miss” the study room and wander to other rooms, and again I had to stand there, watching them getting lost and frustrated. So, I added a hint to aim players at the right direction. 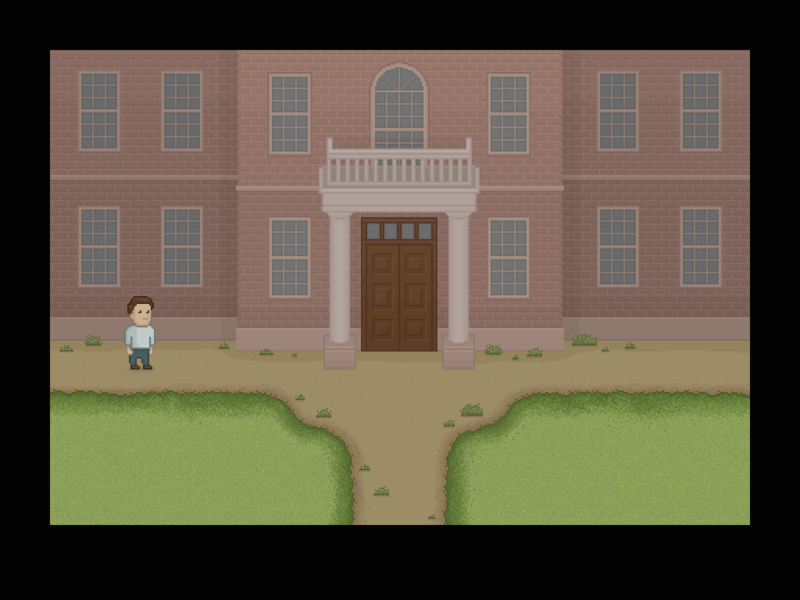 Now, when entering the rooms adjacent to the study room, Daniel will say “I think I hear noises from the mirror study room.” to let the player know there’s something important there. I also added reoccurring doorbell rings, that remind the player that Becky is at the door (after the conversation with llehctiM is over). I think that what I learned is that I can’t take for granted that people would go where I think they would go, and that constant guidance is required. I also learned that there always should be a chance to be reminded of what you’re supposed to do. I hope that the game is better and less frustrating now, but I’m sure there’s still a ton of stuff to be fixed. I’m still working on it, and as always I really appreciate all feedback from players. This is the third and last post about the development process of The Splitting: Chapter 1. I wanted to write about the design and development process, and some problems that I encountered while making this chapter. I think that the most important thing to me during this process was finishing the game. I just wanted to make something that is whole (even if it’s a first chapter), without giving up halfway. I had started a few games before, but apart from Game Jams and Ludum Dares I never finished one, so it was really important to me to prove to myself that I could do it. When I started developing the game, I didn’t have much. I had a basic idea about mirrors that I really liked, a vague storyline and some sketches, but until a very late stage in the development, I didn’t have a final version of the chapter’s flow. I just wanted to start, to do something, so I made a prototype with the basic mechanics, and meanwhile started working on the look of the game. 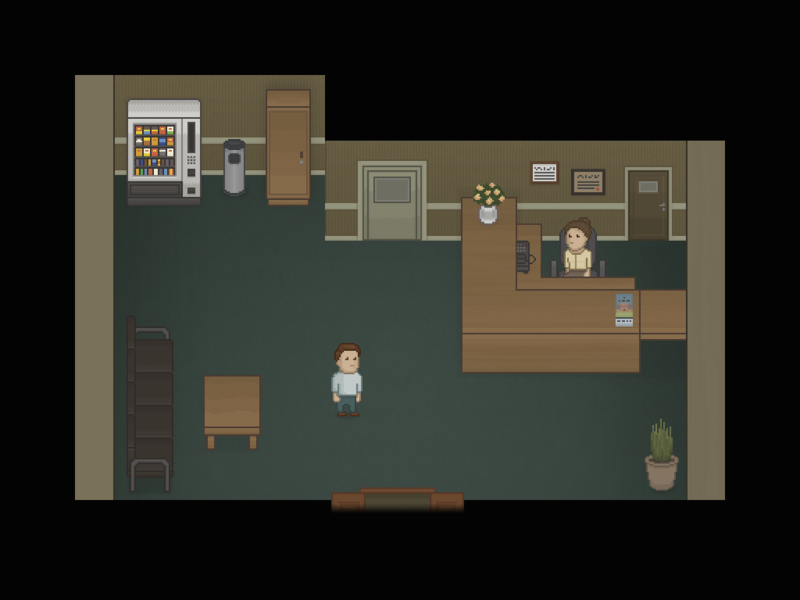 I knew that the game was gonna take place in Daniel’s apartment and I knew what rooms were going to be in that apartment, so I created them. The story part wasn’t easy and was going pretty slowly, so I let myself sink into the programming and the art, because it was clearer what to do there, and it made me feel like I was progressing. So even though I didn’t have the design all figured out, I felt like I had enough to go on, so I just went on with the development. When I got to the point where I couldn’t delay it anymore I sat down and started designing the chapter’s flow. But the ideas didn’t really come. Maybe I was putting too much pressure on myself, or maybe I was already in development mode, but I was really struggling. The flow I eventually came up with was something like this: Daniel wakes up, finds out his reflection is gone, walks through the mirror and meets llehctiM. Then he has to walk around the house and collect 3 clues to the whereabouts of his reflection, after which he’s ready to go, and the chapter ends. It wasn’t a very good flow. also, llehctiM at this point didn’t follow Daniel around, so each time you found a clue (or thought you found one) you’d have to go back to the room where he was at, and that was pretty annoying. The first person to play the game was my mom, and she kinda hated it. She said there was too little going on, that the characters weren’t interesting, and that all in all, the game was kinda tedious. After that, I stayed in bed for an entire day. I tried to convince myself that the game was good, or that I was already too far ahead to change it, but it wasn’t true. So eventually I set down and changed the flow. I added Becky (She didn’t even exist up to this point), more items, more riddles, and llehctiM following Daniel around. 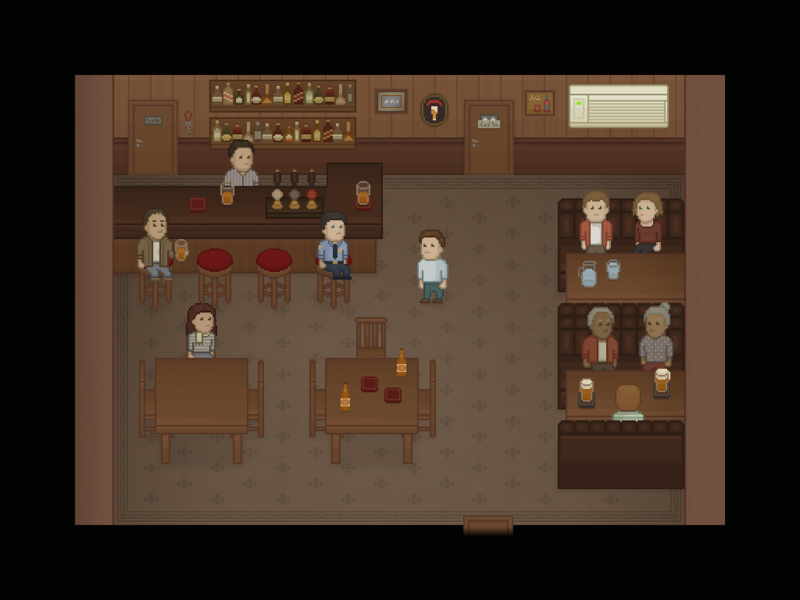 This time my mom liked it, and after letting a few more people play, I released the game. That was on January 2015, and until now I still make changes in the game from time to time. There’s a lot more that I would like to write about, especially concerning the storyline, the world rules, and paradoxes that derived from those rules, but I wouldn’t wanna spoil later chapters. When I finish the game (one day) I will sit down and write about all the questions and problems I had when actually writing the game. This is it for now. Next, I’m gonna start posting about the development of chapter 2. On this post I’m gonna talk about the early stages of The Splitting’s design. It’s gonna contain some spoilers for the 1st chapter, but not for later ones. So, I knew I wanted to do something with mirrors, something “puzzely”. I had an image in my head of a screen split in half, showing two rooms – a regular room and its reflection – and the hero passing from one to the other through the mirror and moving objects around. This early design was very “puzzely”, and kinda reminded me of the game Sokoban with its top view and keyboard based mechanics. Later, as the game became less puzzle and more adventure, I decided it would be better if the screen showed only one room, but I kept the view and the controls the way they are. Now it reminded me more of To The Moon. Now I had to define the relationship between the two worlds – how they will react to each other – which would also determine the game’s mechanics. The heart of the game, basically. At first I thought they could affect each other equally – when you move an object in one world, that movement will be copied in the other one. Then I thought it could be more interesting if the relationship wasn’t symmetrical. Maybe the real world could control the mirror world, but not the other way around. As the game progressed and the world and story became more dominant, It also became more important to me that the world will make sense as a whole, as a system with rules, so I decided the mechanics should come from there. So I went back to the beginning and started with a simple situation – Let’s say, a person with a reflection lifts an apple in the real world, and meanwhile, in the mirror world, his reflection lifts the apple’s reflection as well. The reflection, being in some sort of hypnotic trance, copies the real person’s actions in perfect synchronisation. But, what happens in the mirror world when a person without a reflection lifts an apple? I wanted the world to feel natural and logical, so I went with the answer which felt most natural to me, which is that nothing would happen on the other side. The apple will stay where it is. In the first example the reflection was responsible for lifting the apple. In the second example there is no one to lift it. The hero, being without a reflection, will have to use people with reflections throughout the game, if he wants some actions to have a symmetrical effect on both worlds. He will also have to use them without them knowing, because people with reflections don’t know about splittings and the mirror world. This creates an a-symmetrical relationship between the two worlds. You can only talk to people in the real world, because the reflections, being in their trance, can’t hear or see you. So you can affect the mirror world through the real world, but not the other way around. The story began with a few random thoughts. What I already knew was that the hero’s reflection is gonna be missing from the beginning. There was no point delaying it. The reflection has to disappear so that the hero could pass through the mirror into the other world. Also, I wanted the game to start out with this mystery. The hero will have to find out the reason why the splitting happened, which would require him to both investigate the mirror world, learn about splittings in general, and to learn about the events in his life which led to his specific splitting. Another thing I already knew was that I wanted the mirror-less rooms to be chaotic, like that closet no one ever opens so no one bothers cleaning it up. And then I thought – this could be a good place for someone to live in, especially if they don’t want to be found – And that’s how llehctiM was born. I thought it would be cool if there was someone hiding in the mirror house, who could also function as a guide for the hero as he learns the basic rules of this world. The idea of him being the twin of the criminal Mitchell came kind of naturally, since I needed a reason as for why he needed a place to hide in the first place, and I wanted to bring some version of the prisoner from my short story to the game. Now I’m gonna get a bit more technical and talk about some problems I encountered at the very early stages of the game’s design. 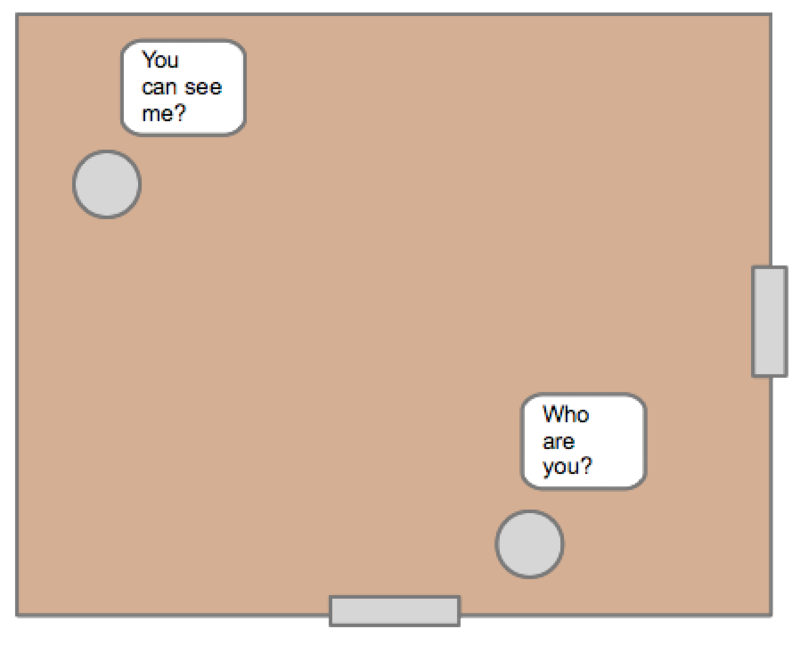 Quite early in the design process I discovered a problem – When the hero passes through a side mirror, he will enter a room which is flipped horizontally. But what about a front mirror? Will the mirror world be flipped vertically in this case? 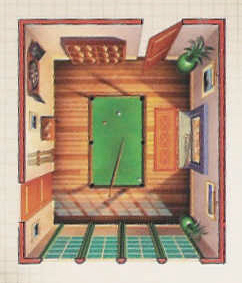 It would create 2 views for each world, as shown in the picture, an addition which require a lot of work, and worse – it could confuse the player. I was trying to decide weather to allow front mirrors or not. If I did allow them, I should consider letting the player rotate the world, in order to navigate between the different views. but then I reminded myself that I wanted to keep the game simple, so I chose to avoid front mirrors and only flip the world horizontally. It’s kinda funny, because a few months later, deeper into the development, I wanted to add a mirror, cause traveling to the bedroom every time in order to pass through the mirror just wasn’t working, so I added one in the living room. A front mirror. But when you go through it, the world flips horizontally, not vertically. I can’t say it bothers me that much, And I don’t think anyone else cares either. Another choice I had to make was the side walls. Usually, top view games don’t have side walls. Take Pokemon or To The Moon for example. They don’t have them and they don’t really need them. But I wanted to have side walls. I wanted the mirrors there, so when the hero will pass through one, the player could see both his face and the mirror. Pokemon and To The Moon. No side walls. I considered a few options, the main being a Clue-like graphic style, which gives the room perspective and shows a bit of the side walls. But I didn’t think that would look good with the pixel-art style, which doesn’t do to well with diagonals shapes. Plus, this view would show only the top of the hero’s head, and I wanted the player to see his hero’s face. I was already thinking about cancelling side walls and side mirrors all together, but then I remembered that an early sketch I made of the apartment had mirrors on the walls. I went back to that sketch and I decided to try and make this work. It does twists the perspective a little, and some people have a problem with it. But still, most people don’t see anything wrong with it, so I believe this is the best choice. Apartment sketch with side mirrors. The the final bedroom graphics, with the side wall and the side mirror. This is it for now, thanks for reading! I thought maybe I should start from the beginning, so on this post I’m gonna give some background for the making of “The Splitting: Chapter 1”, and write about what brought me to some of the ideas in the game. So, I have been trying to make a game on my own for a few years now, ever since I finished my game design studies. 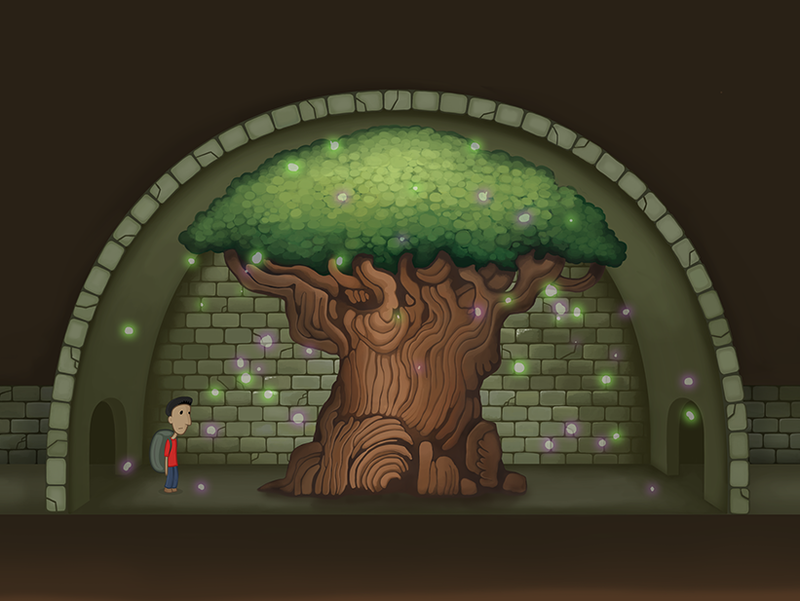 I started out with some big ideas for big games, which never made it through the early stages of development, and it took time to both polish my skills and overcome my tendency to over-scope. 1) It had an outrageous amount of graphics to it, and barely any story. halfway into the development I lost motivation, because I had so much graphics to create, but not enough story to make me feel connected to the game. I’m not saying that everyone needs a story in their game, but it’s definitely something I need to keep me going. 2) Because it was the first chapter of the game, I took an approach of “saving the best for last” – I had some great ideas for the next chapters, but thought they were too “crazy”, and that in the first chapter I should be easing the players into things. But what actually happened was that the first chapter became kind of dull, and didn’t have any of the cool stuff that was supposed to make the game special. So… before starting my work on “The Splitting”, I have already decided I should keep the graphics to a minimum, and focus mainly on the plot and riddles. This decision helped a lot, because it let me spend more time on the part that I love most about making games – creating worlds and stories. It also helped me decide on the graphic style, a simple pixel art style, instead of the time consuming hand painted style I used for “Sewer Fairies”. The second problem of “Sewer Fairies” was going to hit the first chapter of “The Splitting” as well, but that will happen much later. the first inspiration source for “The Splitting” has actually been running around in my head for more than a decade – ever since I played “Zork: Grand Inquisitor”, a first person point & click adventure from 1997. At some point in the game you enter your sidekick’s bedroom, and find out you are able to pass through the mirror into a “secret mirror room”, which involves a cool riddle where you have to connect two scroll parts, one of which is reversed. I remember loving the idea, and being sorry that the game did not develop it any further. Also, while playing, I have noticed that when you approach the mirror you don’t see your reflection in it. This fact is kinda taken for granted, maybe because an invisible player character is a consistent theme throughout the game – you never actually see yourself, and even your hands are invisible when lifting objects. But I still remember wondering – if you did have a reflection, would you still be able to pass through the mirror? About 3 years ago, I submitted a short fantasy story to a short stories contest. The theme was “reflections”. My story was about a man on his first few weeks in prison, who discovers that his cell mate sometimes disappears at night. One night, when his cell mate is gone, he looks through his stuff and finds a big mirror, hidden under the mattress. He tries to enter the mirror himself, but can’t figure out how to do so, so he waits for his cell mate to return and then threatens to break the mirror unless he tells him his secret. The cell mate then reveals to him that you can’t pass through the mirror unless you get rid of your reflection, since your reflection is what physically stops you from passing. The story didn’t win the contest, but it was a beginning for the game’s idea, and also an inspiration for Mitchell and llehctiM’s story. In Zork, we come across the ruins of a once prospering magic university. All that’s left of it now is an old fountain. Near this fountain we discover a portal to a parallel dimension – “The ethereal plains of Atri”, where the university still exits in all its glory. The fountain, being the only thing in common between these two dimensions (though affected by the ravages of time in the real one), is in my opinion very meaningful. It functions as a link, and it’s no coincidence that the portal is placed right next to it. What I really liked about this part of the game is the feeling you get when standing next to the fountain – You feel the existence of both dimensions at once. When you walk away, they grow further apart. In “The Splitting”, this is the exact same role of the mirrors, but here they function both as the portal and as the link between the worlds. A room with a mirror in it will look exactly the same as the “real” room, but a room with no mirrors will immediately start dissolving, going back to the chaotic nature of the mirror world. This will be even more obvious in the next chapters, when Daniel and llehctiM are travelling deeper and deeper into the “shadows” and away from the mirrors. Another version of this idea exits in the “Chronicles Of Amber” series, where Amber and the chaos are the only real worlds, and all that lies between them is just various reflections of the two. The further you get from Amber, the closer you get to the chaos, and your surroundings change accordingly. In this series, the worlds outside of Amber are called the shadows, for it is like the shadow that Amber is casting, similar in shape but not real. 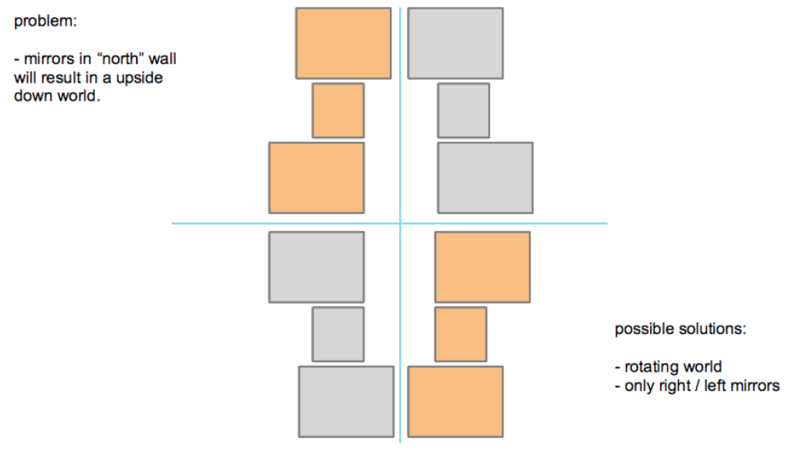 In “The Splitting”, rooms without mirrors are called “shadow rooms”, not because they are shadows themselves, but because they are not affected by the mirrors’ influence, and are hidden from the eye of anyone who’s standing in the real world looking through a mirror. This is about it for now. 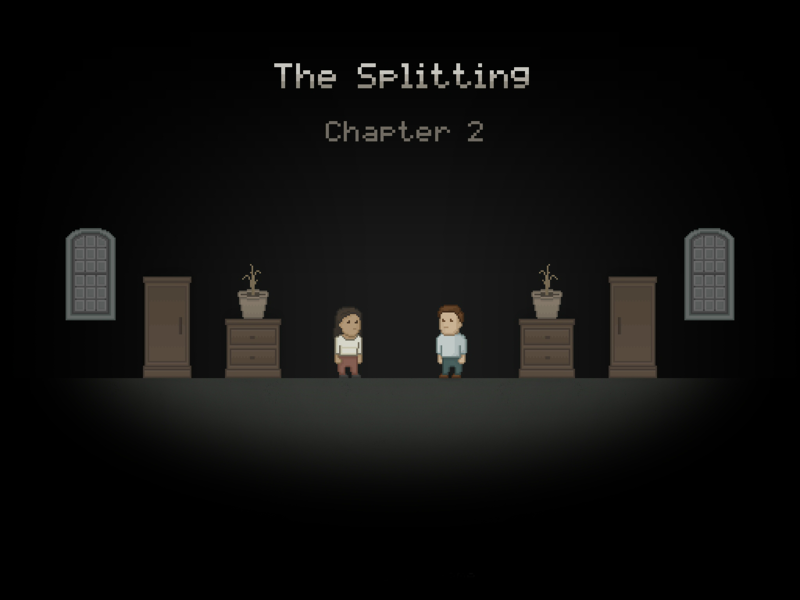 In my next post I will write about the early design process of “The Splitting: chapter 1”. Thank you for reading!